There’s a luscious quote in this post from Exploring London! A re-post to commemorate the death of the niece of my several times removed grandfather Theophilus Leigh. On this day in 1817, Jane Austen, daughter of Cassandra Leigh and George Austen, died in Winchester from what has at different times been thought to be cancer, tuberculosis and Addison’s Disease. The latest suggestion is arsenic poisoning. Enjoy this showing of her humour. 1810 sketch of Jane Austen by her sister, Cassandra. Forget the shy, retiring Jane Austen — we have her nephew James Edward Austen-Leigh’s memoir of his aunt to blame for that idea — here is an extract from a letter she wrote from Steventon to her sister Cassandra on 20th November 1800, after attending a ball. Austen liked to have fun. No one who can write so amusingly and with such charming detail about life and society in her books could have led a reclusive life devoid of society. As a descendant on her mother’s side (Leigh), it is that same sense of humour I like to think I’ve inherited! My favourite sentence is the last one. But then it’s so hard to choose. Who can resist “She appeared exactly as she did in September, with the same broad face, diamond bandeau, white shoes, pink husband, and fat neck.”? To read more of her letters, though too many were destroyed by Cassandra before Jane died, visit Letters of Note. 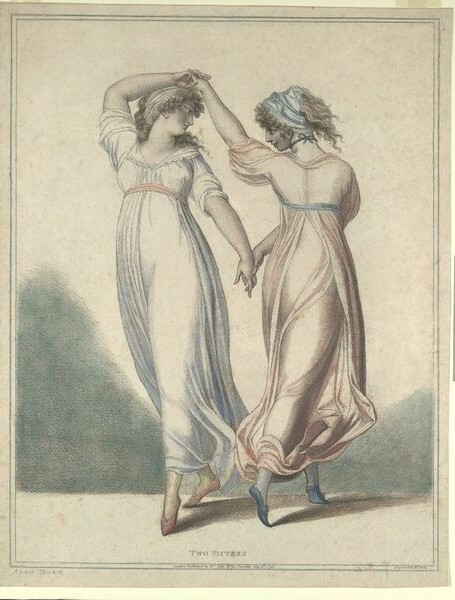 My parents introduced me to many artistic delights but the time when they would have urged me to read Austen was a time that the family was wrenched apart by my mother’s manic depression. Perhaps if they’d told me at that time that there was a blood connection, I just might have approached Pride and Prejudice or Mansfield Park a little differently. I don’t know. As it was, I didn’t read Jane Austen for myself until my late teens, at which point I fell utterly and completely in love with all her work and everything about her. One of the best books I’ve read about Jane Austen is a fascinating volume by Fay Weldon, Letters to Alice in which she casts fresh eyes upon Jane’s work through a series of letters to her niece. She debunks the myths and pours scorn on some of the theories that have grown up around the name and the work. Weldon does this with humour that matches Jane’s. It is well worth reading. As for the blood connection, I didn’t learn about that until the late ’80s, early 90s. I’d known forever that Leigh was a maternal family name but not where it came from, only that my mother had chosen it for her stage name when someone told her that she would never see her name in lights with the number of syllables contained in ‘Benedicta Hoskyns’! I also knew of several forebears whose middle names included Leigh and others whose surname was Leigh. If you know your Austen, you will know where I’m heading! When I did some research, I discovered exactly how we were related to Jane. Even my mother didn’t know the details. Jane’s mother was Cassandra Leigh. Cassandra’s father, Thomas, was part of the Leigh family of Adlestrop, Gloucestershire. He had a pugnacious brother, Jane’s great-uncle, Theophilus Leigh (1693-1784), who was Master of Balliol for more than 50 years and known for ‘overflowing with puns and witticisms and sharp retorts‘. These are the words of Jane’s brothers’ descendants, William Austen-Leigh and Richard Arthur Austen-Leigh in Jane Austen, Her Life and Letters, which was published in 1913 as an updated follow-up to Jane’s nephew, James Edward Austen Leigh’s memoir — A Memoir of Jane Austen: and Other Family Recollections — from 1870. These two later Austens go on to say that Theophilus’ ‘most serious joke was his practical one of living much longer than had been expected or intended’! So where do I come in? Theo, as I feel I can call him — somehow I doubt that was ever the case in his lifetime! — had several children, one of whom, Mary, went on to marry Sir Hungerford Hoskyns, 4th Baronet. I come down from there but I won’t bore you with the details! To cut a long story short, Jane Austen’s great-uncle was my great-grandfather seven times removed — or near enough! Jane Austen was born on 16 December 1775.